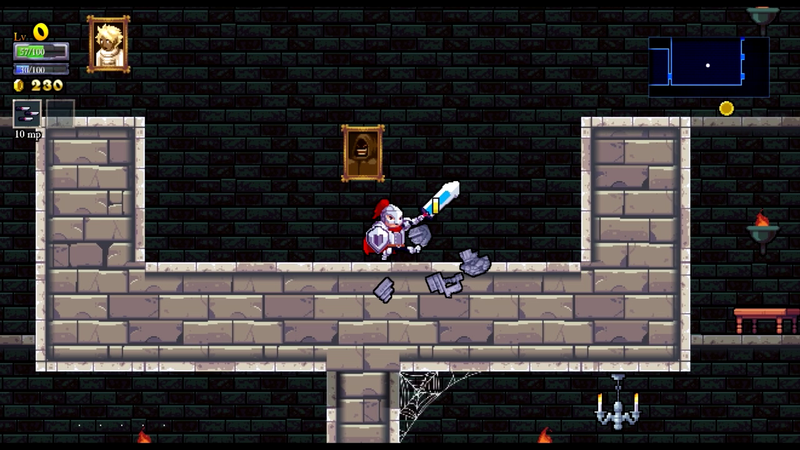 Ahh, Rogue Legacy. My favorite rogue-like game, although it also served as my introduction to the genre. Even after playing a lot of others from the genre now, I still look back on Rogue Legacy as my favorite out of the bunch. The game is presented in a pixel fashion, making use of some nice looking sprites for the various people and enemies you will meet along your journey. This style fits well, especially for a game of this genre. Come to think of it, I don’t think I’ve played a rogue-like that was not in this style, and I’ve played several of them over the past several months. Can’t really complain either, there’s nothing wrong with it and I’d actually prefer this style in a rogue-like game, although I may be a bit biased there (heh). 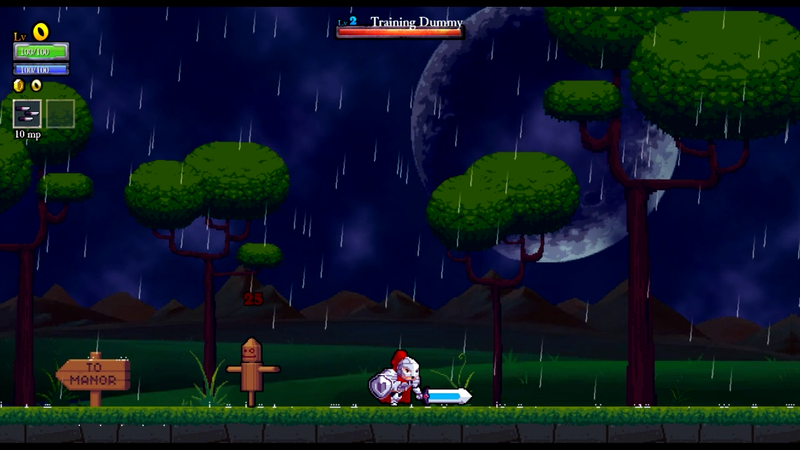 Rogue Legacy’s niche is the rebirth mechanic. Upon dying as one character, you’ll have the choice as to which of the three offspring of that character you’ll play as next. The interesting thing about this mechanic however, is that each child has separate traits, disguised as real world disorders and conditions. These can either be in your favor or against it. ADHD, for example, works in your favor in that your character will move 30% faster than usual. My favorite defect is vertigo, which mirrors the screen vertically. Yes, everything, including menus. Vertigo is a pain to deal with as I cannot rotate my monitor upside down, forcing me to play upside-down. Aside from that gimmick, the other half of the game is the immense class and upgrade system. You’ll start off with no skills, playing as the default class, the knight. Upon death, the opportunity to choose offspring with a different class is presented. The basic classes to choose from contain classes such as: mage, knave, knight, barbarian, shinobi, miner, etc. Each class can be upgraded, getting a name change in the process. The shinobi, for example, changes into the hokage, my favorite class. Each class has its own advantages and disadvantages, keep that in mind. The shinobi/hokage has the benefit of upgraded strength (175% to be exact), but at the cost of only having 60% HP, 40% MP, and not being able to take advantage of critical hits. I never really used the game’s spells, so the MP cut didn’t have much of an effect on me, but the HP and critical hits were quite the drawback. Even so, whenever I was given the opportunity to play as a hokage, I always took it. You can’t beat 175% damage. I found it crucial to defeating some of the game’s bosses. I actually defeated the forest boss (the second one I took on) without getting hit as a hokage, quite the achievement. On top of the classes, there’s also a plethora of upgrades to choose from each time you die. The upgrades are laid out in a branching format, with certain upgrades unlocking others. The first one made available is Smithy, the blacksmith. Once purchased, you’ll be able to purchase both armor and weapons from him. There’s also an architect (who can keep the last layout of the castle if you choose to not want the game to randomly generate another castle again) and an enchantress, who sells runes, which can be equipped to provide various abilities (like the ability to jump while in air). 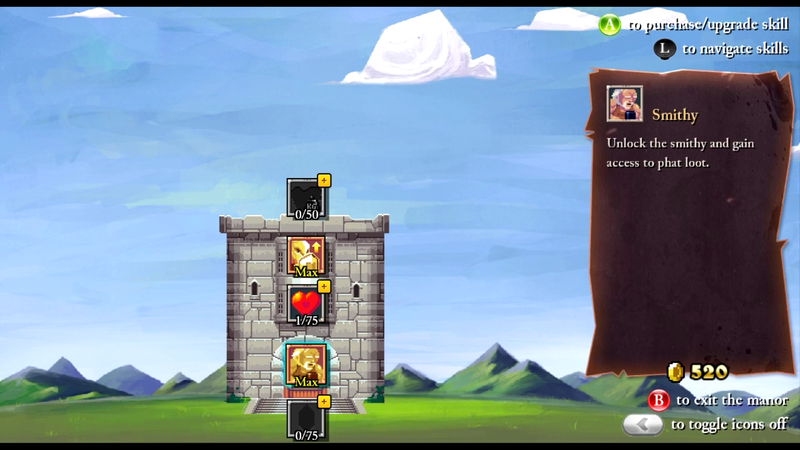 The other upgrades consist of class upgrades (like barbarian -> barbarian king) and stat upgrades. This consists of mana, health, and equip upgrades. Equip upgrades allow you to carry more weight and is required if you ever want to wear good armor. There’s plenty of other upgrades to base skills (attack up, magic damage up, armor up, etc.) and a few unique ones, like “death defy” and “haggle”. Death defy, as you can probably tell, allows you to defy death (1.5% everytime the upgrade is purchased). 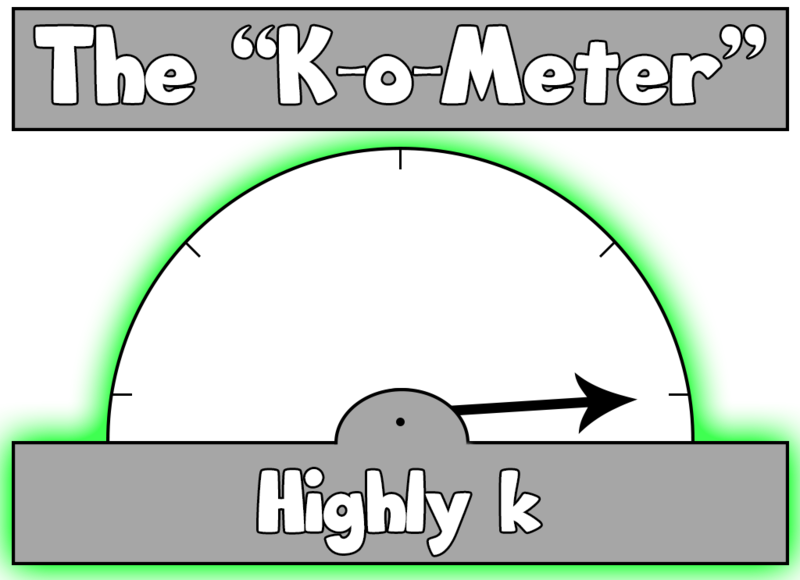 Haggle, on the other hand, lowers Charon’s toll when entering the castle. The game’s map is divided into five zones: the front “safe” area at the entrance to the castle, the castle, the maya (above the castle), the dungeon (below the castle), and the forest (to the right of the castle). Each area (aside from the safe area) has its own boss that needs to be defeated if you want to unlock the golden door at the entrance of the castle. These bosses are very difficult if you’re not properly equipped (I did tell you about my love for the hokage class, right?). Each time you die and want to re-enter the castle, you’ll have to give up all of your funds earned during the previous run to Charon, who guards the entrance to the castle. 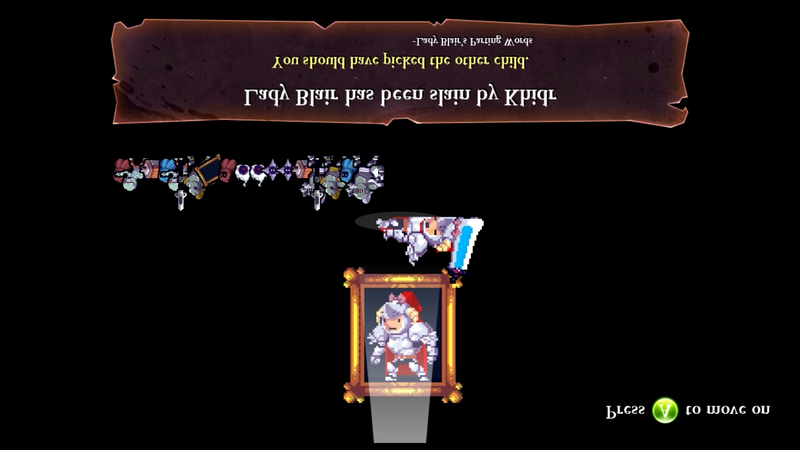 Rogue Legacy is a fantastic game overall. The sense of progression is really profound and it just feels really, really satisfying to defeat the bosses and open that golden door. Now that it’s only $15, why not give it a shot?